Venezuela is experiencing an extremely serious period due to the attempt of its oligarchy to force a coup détat, openly sponsored by Yankee imperialism and its allies, taking advantage of the deep economic and social crisis that the country is experiencing and the weakness of the Maduro Government. Behind this new attempt is the US, which has always considered Latin America and the Caribbean as its back yard. The list of reactionary coups sponsored by Yankee imperialism and its partners is endless. Throughout the second half of the 20th century and up to today, the imperialist hand has been behind a long series of violent protests that have caused immeasurable suffering to the working class and fraternal peoples: Brazil and Bolivia (1964), Peru (1968) , Chile and Uruguay (1973), Argentina (1976), Paraguay (1989), Haiti (2004), etc., are some examples. The imperialist army itself intervened directly in Cuba (Bay of Pigs, 1961), the Dominican Republic (1965-66) and Panama (1989). Today, the worsening of the capitalist crisis is causing the sharpening of the commercial, political and also military struggle among the great imperialist powers to gain spheres of influence. They have never left Colombia, and in Chile, Argentina, etc., the most reactionary right-wing that is submissive to Yankee orders is again occupying the governments, taking advantage of the profound contradictions that have ended up overturning the experiments of social transformation led by the reformist bourgeoisie, which in no case put in question the power of the national oligarchies. However, despite the serious contradictions of the extensive reformist movement that promised a new direction for the Latin American laboring classes from one end of the subcontinent to the other, without actually changing the power structure in their countries, what is at stake now is the submission of the brotherly peoples to the dictates of US imperialism, their submission to the Yankee boot, and the imposition of the stark dictatorship of capital over all of them. No, it is not Bolsonaro, Macri, Piñera, Duque or Guaidó who will bring social justice and peace to the region; its objective is different: to put an end to the dreams of the small and middle bourgeoisie and to re-impose the open dictatorship of capital. The example of Cuba proves that it is only possible to sustain social changes when the instruments of control of the economy are snatched from the oligarchy, and only insofar as they are subjected to popular control. In Spain, monarchist governments have never been neutral with respect to Venezuela: the friendship between Felipe González and the champion of corruption, Carlos Andrés Pérez, who led the privatization of Venezuelan public enterprises causing a social crisis with dramatic consequences, had its continuity in the support of the Aznar Government for the Military Coup attempt that Venezuela suffered in 2002. Nor are they neutral n these dramatic hours that the Venezuelan people are going through. We Spanish workers cannot, therefore, be neutral. The statement of the reactionary Minister of Foreign Affairs, Josep Borrell, subjecting the position of the monarchist state to the decision of the EU, negates once again the sovereignty of the Venezuelan people and sanctifies the imperialist interference in the affairs of that brother country, in order to leave its people alone to face the forces of reaction and imperialism. For his part, the reactionary national leader Casado, President of the PP [People’s Party, Spain], who a few weeks ago offered Trump the use of Spanish soil as a permanent base for the Southern Command and African Command of the Yankee army, has declared his full support for the reactionary coup in progress, expressly requesting imperialist intervention in the internal affairs of Venezuela. The declarations of these and other servants of capital aim to give a veneer of legitimacy to what is nothing but a new interference by Yankee imperialism. We must fight this new attempt at a reactionary coup and express our solidarity with the Venezuelan workers and people, whom they want to subject once again to the dictates of imperialism and the open dictatorship of their corrupt oligarchy. 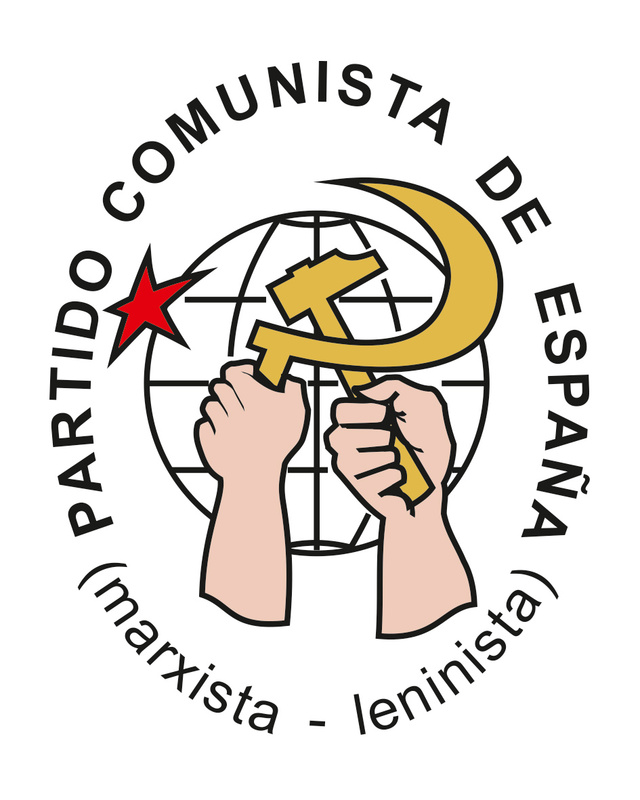 Our Party expresses its full support to the Venezuelan workers, to the revolutionary organizations and, in particular, to our sister party (Marxist-Leninist Communist Party of Venezuela – PCMLV), which under the harshest conditions is promoting a real change that guarantees popular control of the State. STOP THE IMPERIALIST INTERFERENCE IN VENEZUELA! SOLIDARITY WITH THE WORKING CLASS AND THE PEOPLE OF VENEZUELA!